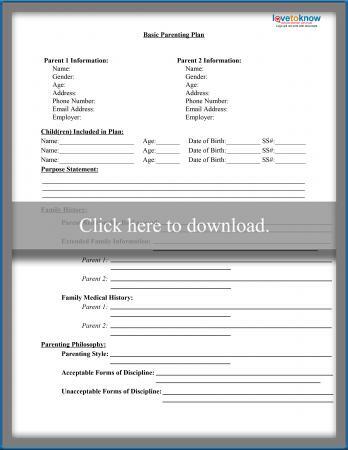 Free parenting plan forms assist couples in custody issues as they wade through the difficulties a divorce may bring. While co-parenting can bring challenges, having a free parenting plan template download can provide structure for both parties to navigate through shared parenting duties and keep the best interests of the child in mind. A parenting plan is often submitted in divorce and/or custody issues. It breaks down the pertinent issues regarding the custody and parenting of any children involved. In many cases, the use of a parenting plan is looked upon favorably by the courts, particularly when the plan offers a variety of choices which show a willingness to be flexible and to be organized. These detailed plans can help stave off power struggles between the divorcing parents and open the door for negotiations between both parties and their lawyers. Click on the image of the plan that works best for your situation to customize and print. 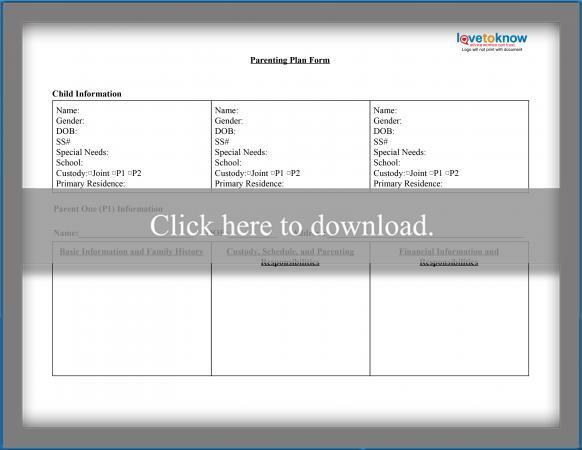 Each printable plan is editable online or you can print and write in answers. If you have any issues accessing the templates, consult the Adobe Guide. A basic plan covers everything from each parent's family history to time schedules and how revisions should be submitted. Simply fill out your personal information then write in descriptive, factual breakdowns for each category and subcategory. If you prefer a quicker, more concise parenting plan this checklist version is for you. For each category of your child's care, you can check whether it is a joint task/decision or the responsibility of one parent. 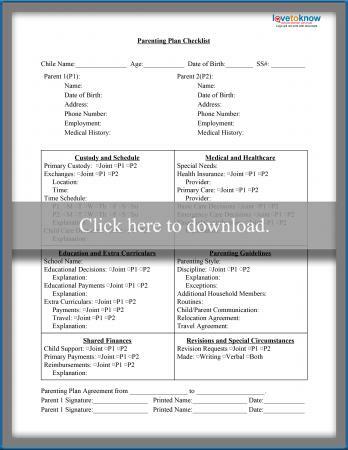 For co-parents with special circumstances or particularly complicated agreements, an open-ended form such as this is ideal. The "Child Information" section is broken down by child for those who may choose different living situations for each one. Each parent then has their own section detailing exactly what they are responsible for in terms of finances and parenting duties. With so many free parenting plan forms available online, how do you know what plan is right for you? The ultimate goal of a parenting plan is to ensure that the children are cared for and that both parents maintain a good relationship with the child. Obviously, a free parenting plan template download will not essentially guarantee that everything will go smoothly throughout and after the divorce. However, there are several points that should be considered as you draw up a parenting plan. Family history-Since you don't know who will be viewing your parenting plan, it's safe to assume that whoever does read it really doesn't know anything about you, your spouse, and your family. Give a brief history in a page or two including how and when you met your spouse, info on your extended family, and where you have lived and worked throughout your marriage. You should also include a medical history of both parents. Parenting philosophy-In this section, briefly state your parenting philosophy regarding how you want to raise your children. This should include religious preferences, discipline practices, and any other topic that addresses your kids' needs, such as extracurricular activities, school records, insurance plans, income tax information, and emergency contacts. Parenting schedules-This is the most important part of the parenting plan, as this section will discuss visitation schedules. To show that you are willing to be flexible (which most judges appreciate), put more than one suggested visitation or custody schedule on the plan. Be sure and outline things like holidays, birthdays, and other special days, and include times and places for pickups and drop-offs. Parenting plan purpose-As you draw up the plan, keep in mind the purpose for relating such details. It's important that you state only the facts unless otherwise asked. This plan may be used by the judge, mediators, child psychologists, and guardian ad litems in the determination of primary physical custody and visitation issues. Today's custody issues are often settled with a verdict of joint legal custody. 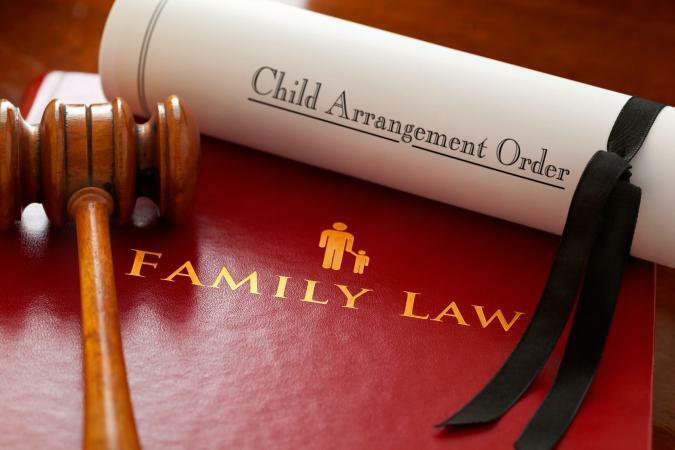 However, one person is typically awarded primary physical custody, which means that parent's address is the one used on any legal forms, and the child may stay more often with that parent. The parent with primary physical custody is usually the one who receives child support as well. Divorce or separation can be difficult on all the parties involved, but a parenting plan helps break down the issues and provide clarity on the many aspects of co-parenting. Keep in mind that not every plan will work for your situation. If you are using the form for legal proceedings, make sure it meets your state's guidelines for written parenting plans.